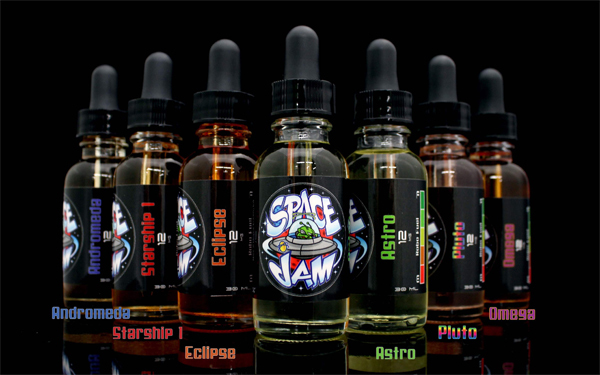 Space Jam offers quality e-juice products with many very creative blends of flavors. This brand is a customer favorite among avid vapors looking to try new high quality flavors. Pluto: A very delicate mix of watermelon, honeydew, and cantaloupe, with a finish of bubblegum and the slightest hint of mint. Andromeda: The original flavor made by our Mix Master. A unique blend of fresh wild blueberries filled with an exotic pomegranate. Starship: A savory mix of vanilla custard inhale with a succulent tropical kiwi on the exhale, very similar to a crème brûlée. As an authorized dealer of Space Jam E-liquid, we offer a price match guarantee across our complete line of Space Jam e-juice products. We will Meet Or beat the price of any local Kansas City competitor. Additionally, we offer manye-cig options to enjoy Space Jam e-juice. We aim to become the best place to buy Space Jam e-juice in KC 2016.